Challenge your abdominal muscles with three tough core exercises from STACK Expert Miguel Aragoncillo. When creating a well-rounded abdominal routine, it's important to remember the multiple planes in which the body can move against resistance. Among the many movements not commonly seen in commercial gyms are the Pallof Press, One-Arm Farmer's Walk and the Standing Ab Wheel Rollout. 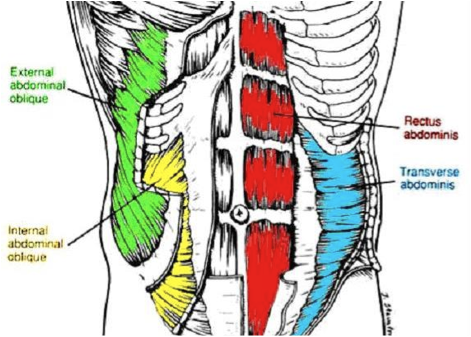 The Pallof Press is an anti-rotation exercise meant to develop the deep musculature of the abdominals, namely the external and internal obliques. As you perform this movement, don't try to muscle the weight and absorb the force of the load with your arms. Prevent rotation of the cable with your core musculature. To get the most out of this exercise, inhale for three seconds and exhale for six seconds while holding the handle in front of you. This will test the stability of your obliques as the exercise brings you out of an anterior tilt and help prevent rib flaring during the movement. This is an anti-rotation and anti-extension exercise that uses heavy weight, so it also taxes the grip. The instructions are simple: Perform Reverse Lunges with a heavy weight for 3 to 5 reps, then, holding the weight in one hand at your side, walk for roughly 25 yards (or longer, to make it more difficult). To perform the exercise correctly, keep your head from poking out into cervical extension, keep your ribs from flaring (put a hand there to help reinforce proper posture) and squeeze your shoulder blades back and down. The Ab Wheel Rollout from a standing position is a truly advanced exercise, one that challenges core stability as your body extends. To keep yourself steady, tighten your core and brace your stomach as if you were anticipating a punch to the gut. Squeeze your glutes as you move to prevent your lower back from arching, which can be painful. Some exercises that will help you accomplish this include the One-Arm Slideboard Push-Up and the Ab Wheel Rollout from a kneeling position. To increase the difficulty, use variations with a pause. Common issues that are exposed when executing this movement include lack of shoulder flexibility, getting the arms into an overhead position at the bottom of the movement, excessive rib flaring and losing tightness in any portion of the body, as this is a whole-body movement. Perform these three movements at the end of your lifting session to really tax your core and induce maximal fatigue in your abdominals.